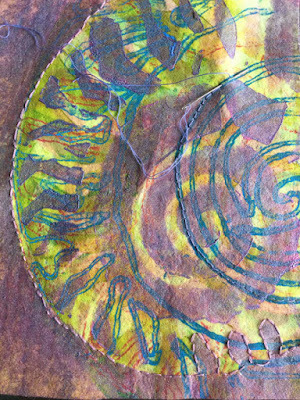 Transfer printing with Avalon Embroiderers Guild April 22nd and 23rd and The Journey at St Ives 25th and 26th April. Transfer printed acetate satin decorated with transfer printed applique. 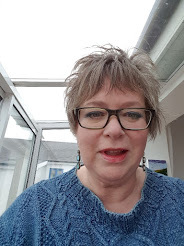 Apologies for the delay in this post - I am just catching up with the teaching I have been doing for the past week or so. 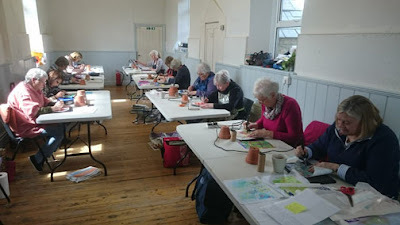 These are the first two of seven workshops on my teaching tour of the West Country. 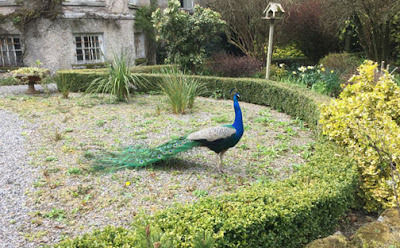 My first stop was Catcott in Wiltshire where I stayed with the very lovey Sue Anderson. 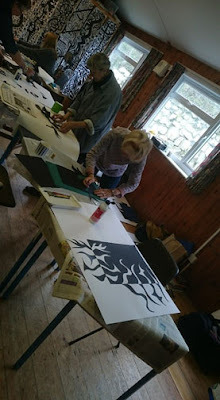 The workshop was Transforming Transfer with the Avalon Embroiderers Guild. They are a fabulous group. Very friendly and helpful and they produced some fabulous work. This is their website with contact details. If you live in their area, they would be a great group to join, there is lots going on with something for everyone. 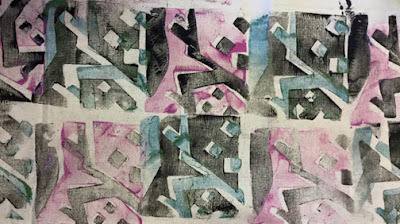 Transfer paints (disperse dyes) are painted onto copy paper. When dry they are ironed onto synthetic fabric. 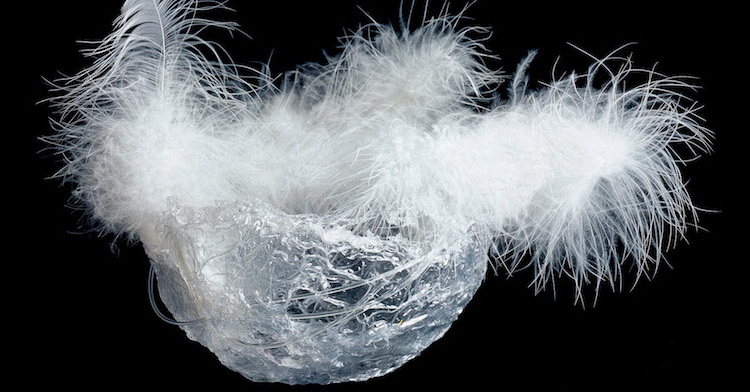 The dye forms a chemical bond with synthetic fabric and is immediately washable and colourfast. 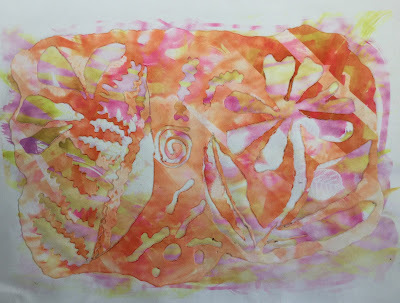 Painting the transfer paints (disperse dyes) onto copy paper. 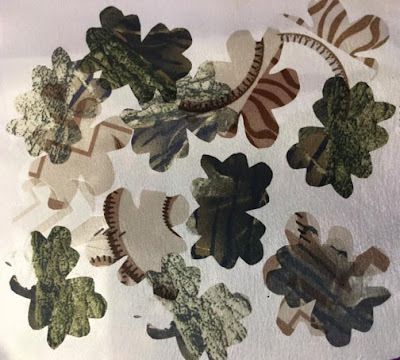 While we waited for the painted to papers to dry, the group played with pre printed disperse dyed paper in the form of paper bags and cheap flower wrap. 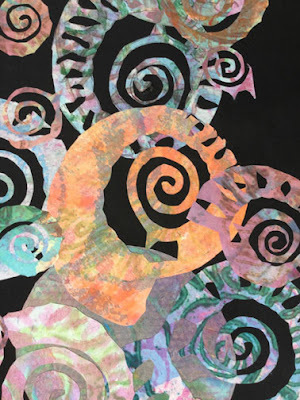 Cut paper shapes ironed onto synthetic fabric. 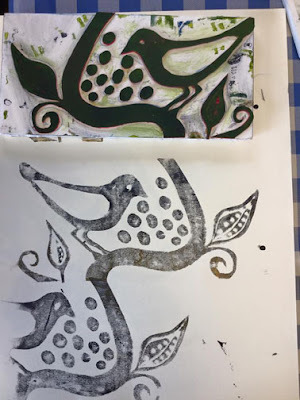 A beautiful resist print using Physalis seed heads as the resist. I find using a one colour print helps you see the definition of the seed head. 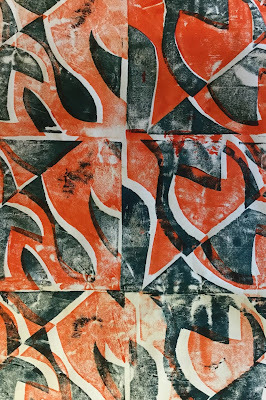 Once the painted papers were dry, the group began to iron them onto a range of synthetic fabrics. 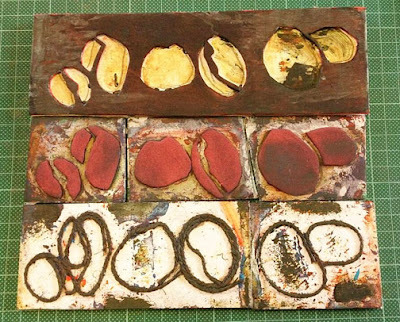 The papers were torn, layered and used with resists. 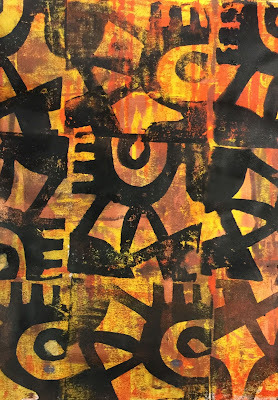 You can usually get at least 3 prints form one piece of painted paper. If you keep overlapping your prints you get a very beautiful translucent effect. 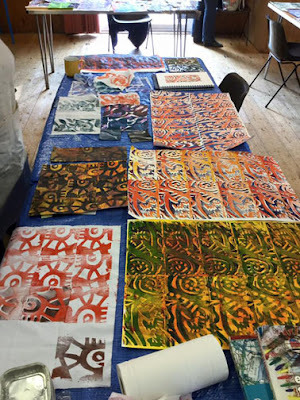 Once the group had a good selection of fabrics, they chose two pieces, one to cut up and one to be used as a background. Bondaweb was ironed onto the back of the fabric that was going to be used for the applique shapes. The backing paper is left on. It is a helpful guide to how hard you are pressing with the soldering iron. If you cut through the paper, you are pressing too hard. 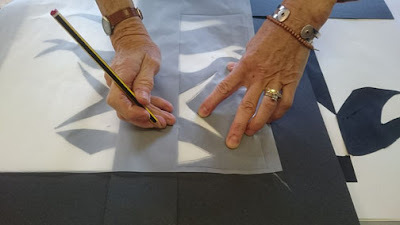 You can cut your applique shapes with scissors if preferred, but as the fabric is synthetic it can be cut with a soldering iron and you can achieve more intricate shapes. Different examples of fabric decorated with applique. 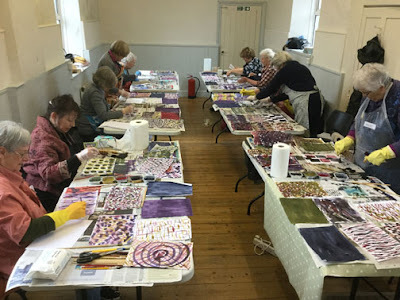 If you are looking for a group to join, I can't recommend the Avalon Embroiderers Guild highly enough. I had a really good time - thank you Sue and the ladies of the Guild. Then it was off to St Ives to teach The Journey. Mararet Garood had arranged the workshop for her two textiles groups. These are private groups, not Guilds. 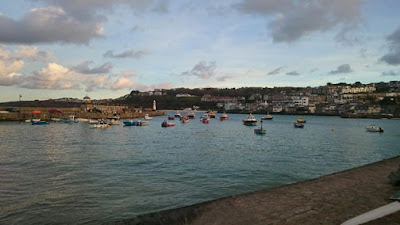 I hadn't been to St Ives for many years, it is still very beautiful, and the roads are still a nightmare. Margaret took me out a walk around the town on my first evening there. There was just enough light to take a few photos. Here is one of the harbour. The Journey is the most satisfying workshop that I teach. 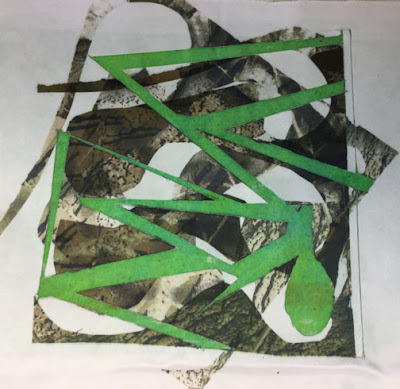 What started off as an exercise to help my students with design in 1998 has now now been taught by me all over the UK and several times in Australia and New Zealand. 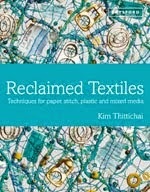 It is also featured in my book Experimental Textiles. 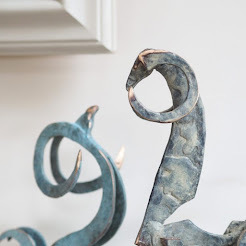 I teach the workshop exactly the same every time, and every time we get fabulous and different results. 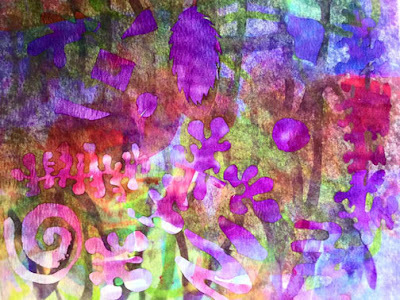 It is a formula for helping students create original designs. Once I am settled in Ireland next year I hope this will be the first of several workshops I will be teaching online. 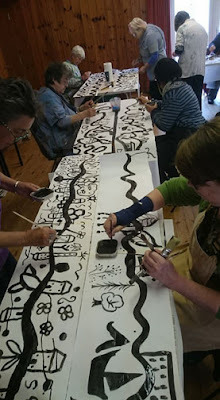 Some of the group painting their Journeys. We also had fun with a 'flipping out' exercise. You can see some fo the Journies in the background. Once the group had completed both exercises, we started to isolate designs with 'L' shapes. 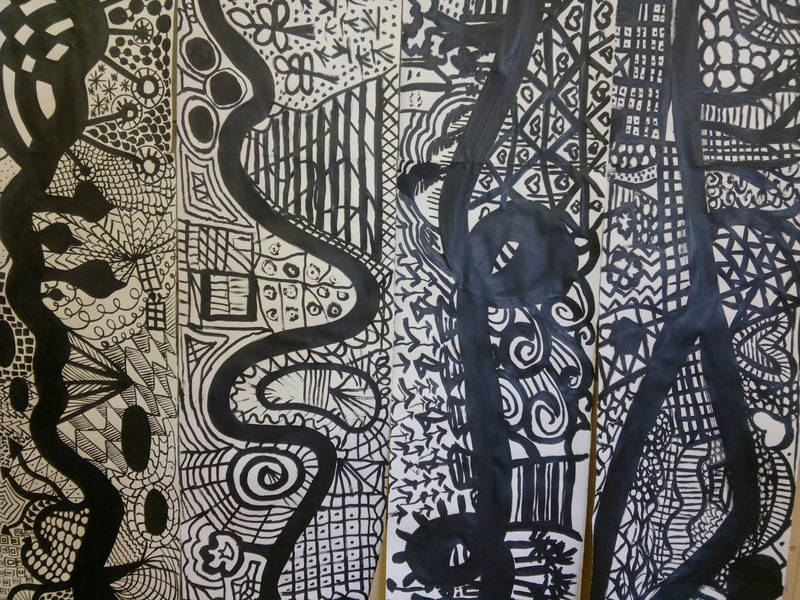 Once selected, the design can be traced off and transferred into a sketch book. Taking a section and tracing the design. 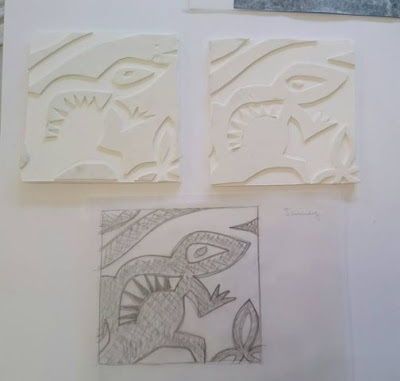 Once the tracings had been made, we could start to make the printing blocks. I make blocks using self adhesive foam for the design, stuck onto foam core board. Here you can see the tracing. As the design is in black and white it is easier to see the positive and negative. You will get two printing blocks form one design. The positive/black and the negative/white. Starting to print with the blocks. 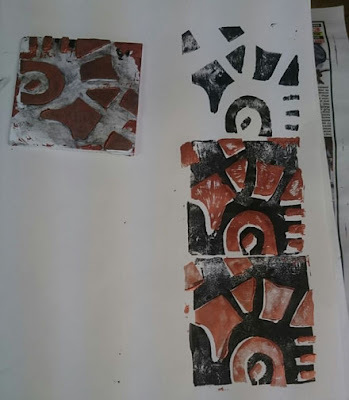 Getting used to blocks, how much paint you need to apply, will they over print? 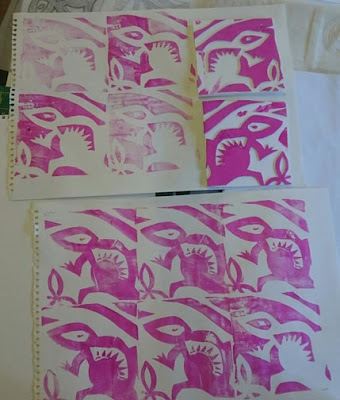 A few of the blocks with their first prints. 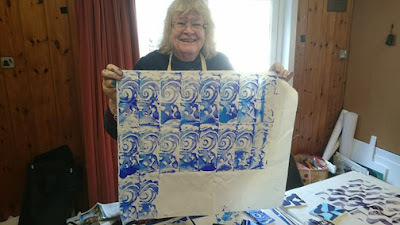 A happy Jo with her first overprints. 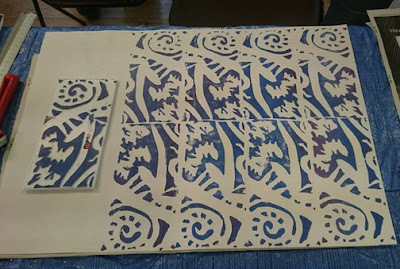 Some of the prints from the blocks made on the workshop. It was a great workshop and I was looked after soooo well. Thank you Margaret and your groups for looking after me so well and making me feel so welcome. So - that's it so far. I now have four days off before I start teaching again. I will be teaching in Torquay and Honiton in Devon and Nailsworth in Goucestershire before I get home on the 12th May. Watch this space. I hope you all have a great Bank Holiday Weekend. Hello Jill, have a good one. Hello Tod, Oh lovely one. Hello Diana - Ha Ha, there is no escape!!!! And Hello Denise if you are reading this. And so the journey begins . . I am traveling in Ireland for a few days. 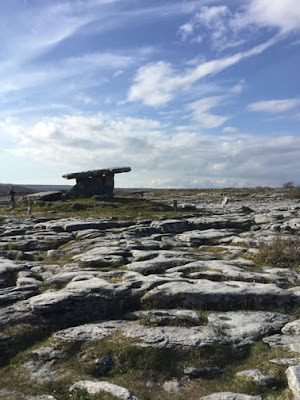 I am here to start getting an idea of which area of County Clare I would like to move to. I have had a wonderful time exploring, wandering off wherever I fancy. 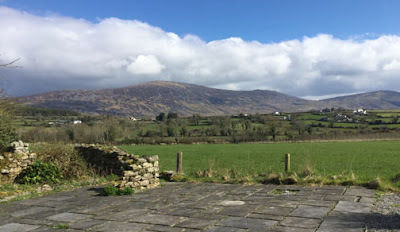 I knew I wanted to be somewhere near the coast - no more than half an hour away, and no more than an hour away from Shannon airport. I THINK I have an idea of where I would like to live now. It will of course, depend on where the house I would like to buy is situated. I may have to compromise. Ideally I would like to live in the triangle between Lahinch, Ennistymon and Milltown Malby. 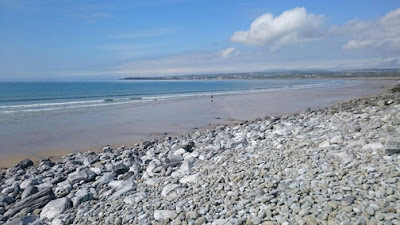 Lahinch beach, very popular with surfers. You can walk for miles, it is very beautiful. There is one very narrow road in and and out. 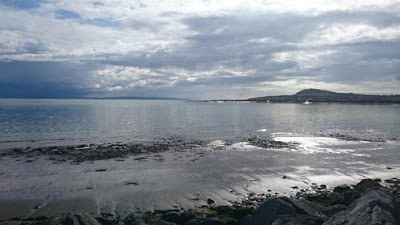 The beach at Lahinch is stunning but will be busy in the summer so not too near there. 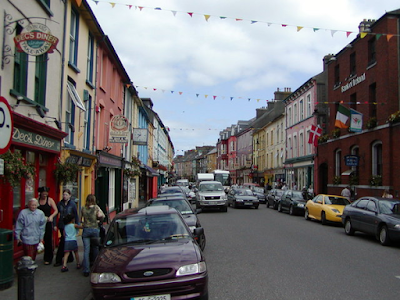 Ennistymon is a lovely, very colourful town. I will need to be close to some kind of amenities. This area would be close enough for me to get to Shannon airport in under an hour and still have easy access to these amazing landscapes . . . 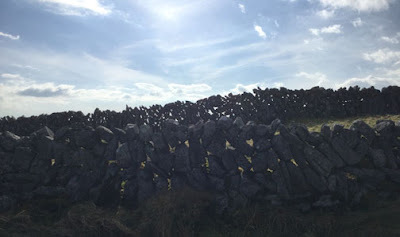 These images were taken around the Ballyryan area on the way up to Fanore. Just remarkable landscape, I can't wait to get back there. They were all taken in half an hour - the light is so changeable here, I love it. The rocks were carved out during the ice age. 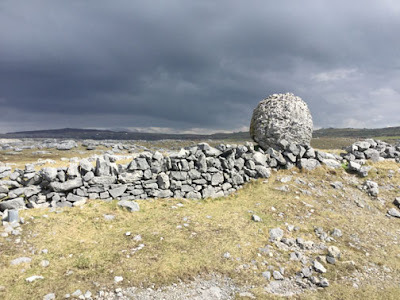 This is the Megalithic portal tomb at Poulnabrone. . . This area is very 'other worldly'. 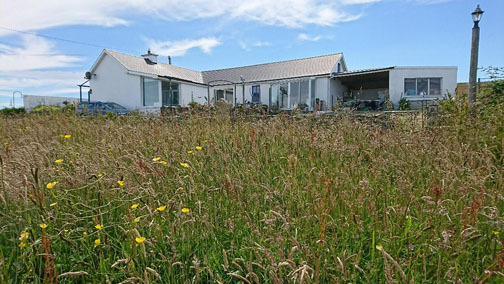 I have also traveled down the coast to where my first cousins, once removed have a house - Carrigaholt. I can remember being on holiday there when I was 9. It is a quiet village and it was great to see the house again after all this time. 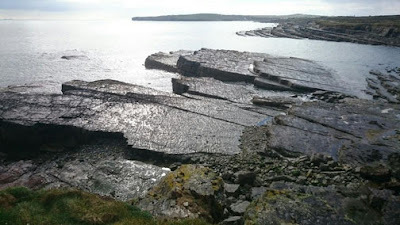 Just along the coast - driving towards Loop Head is Kilbaha - what an incredible rock structure. 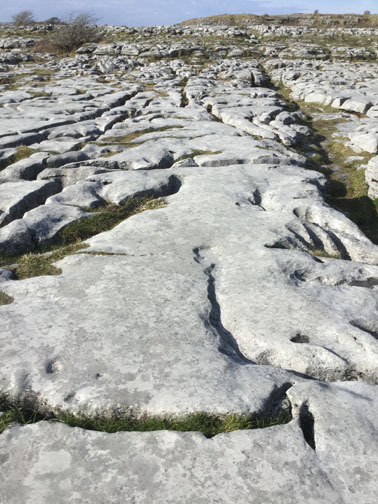 Apparently they are sedimentary folds. I would like to delve further into the Geology of this coast - it really is stunning. As luck would have it, Nicola and I are in the same place at the same time - very unusual as we both teach internationally. I first met Nicola when we were both teaching at the Geelong Fibre Forum in Australia, we have been good friends since. Nicola is helping me get to grips with things I need to know about moving over here. 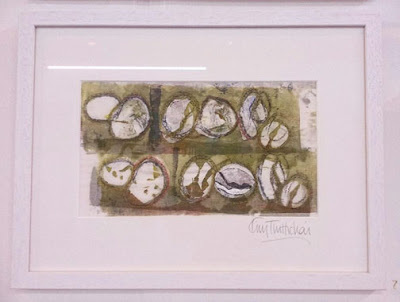 Nicola has a very beautiful house and studio in County Carlow, just out side Borris. It is very peaceful here and of course, Nicola is a fabulous host. 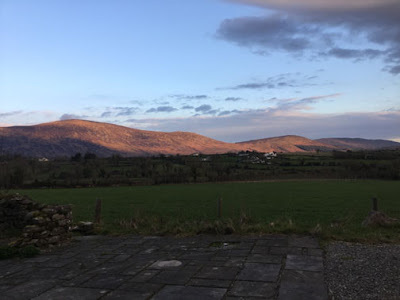 Nicola's house looks out onto White Mountain - part of the Black Mountain Range. It changes colour with the weather, the light is fabulous, it turned rose gold as the sun went down last night. It's mesmerising just watching the changes in light. Nicolas runs several workshops from her beautiful home and she also offers accommodation - what lucky students they will be to stay here. 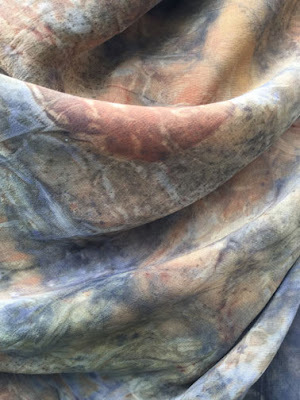 One of Nicola's eco printed and eco dyed silk scarves. 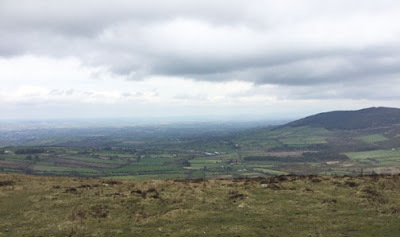 We went for drive around the local area yesterday - this is the view from Mount Leinster. The tallest mountain in the Black Mountain Range. 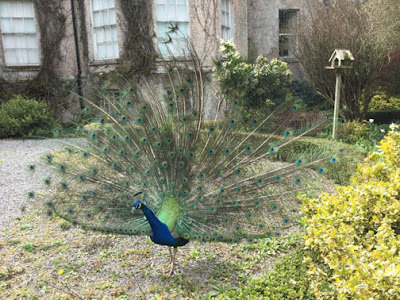 We wandered around Altamont gardens and this very beautiful boy couldn't resist displaying for us . . . I am managing to get some stitch done while I am here. 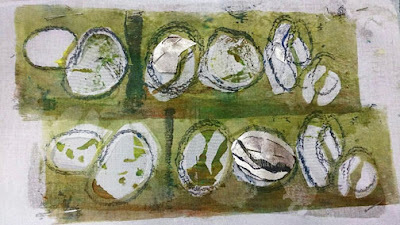 I am working on several small pieces that will go into the Adur Art Trail in June. My rather large Herringbone stitch. We are just off to Borris for lunch so will leave you now - I will be back at Carrigaholt tomorrow then home on Monday night. 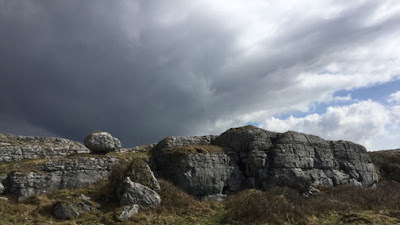 Back to the real world and my tour of The West Country. 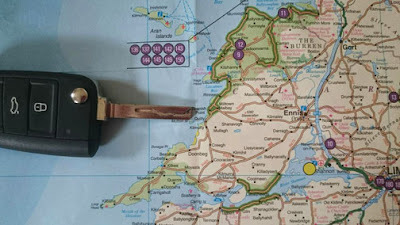 We are making lots of plans for when I am living here in Ireland - it is all very exciting - Whhoo hooo!!! watch this space . . . isn't it great having friends? Talking of friends - not long now Diana, be very afraid. Jill - we will talk. Am choosing somewhere where you will have a great view! And Tod - Am having the best time here, as you can see. Was so good to see Emer. 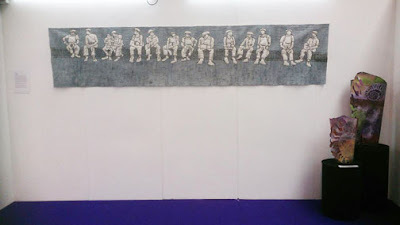 A detail of Susan's magnificent quilt depicting the classic image of the Irish workmen sitting along a beam on top of the Rockerfeller Center in New York. 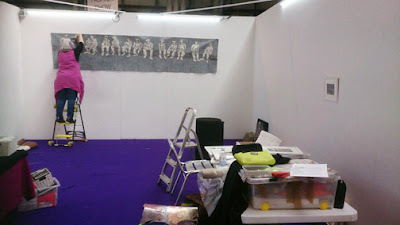 There was me, all excited about showing you my students work at the NEC - and I forgot to show you mine!! 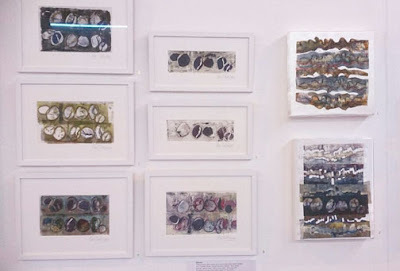 Susan Chapman and I had a gallery space at the show entitled People and Places. Susan loves observing people and you will no doubt be aware that I love all kinds of Nature and Her textures. It is a good thing that Susan makes large quilts, because surprise, surprise, I didn't get all the work I thought I would do, done. The beginnings of the hanging . . Susan up a step ladder. It was great to get the chance to spend some time with Susan and enjoy her fabulous work. I love how well observed her figures are, deceptively simple, but showing the stance of a person with a glance - a great skill. 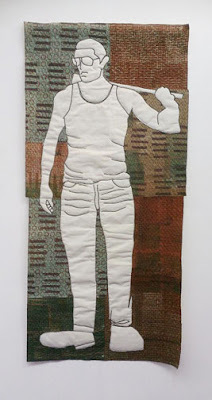 Everyone loved this quilt, nearly everyone recognised where the image was from. 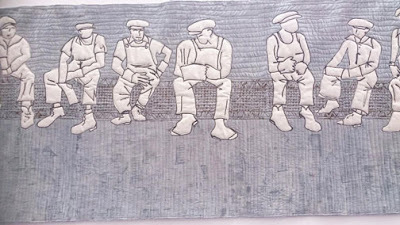 Susan's latest group of figures are workmen. This young man was my favourite. Susan and I are hoping to develop this line of work and have a larger joint show in 2018. Watch this space. It was a wonderful opportunity to have a reason to actually make and finish some work. 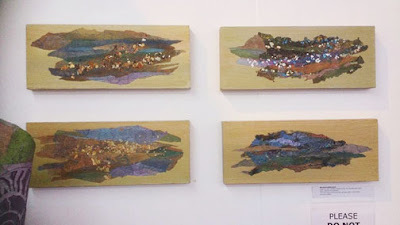 My work was on a much smaller scale - it was more of a transition than a finished body of work, but I did discover a new technique, which I will be developing further as and when I have time. And I will be making time from now on. I am cutting my teaching right down next year. This is a wobbly, slightly out of focus video of my part of the gallery. You may know that I have a passion for 3D, I don't have time to do enough experimenting. I managed to get two 'wraps' made for the show. You can't really call the vessels as they don't have bases. They are transfer foiled, laser cut and laser engraved S133. A heavy iron on interfacing. I definitely want to spend more time on this line of work. 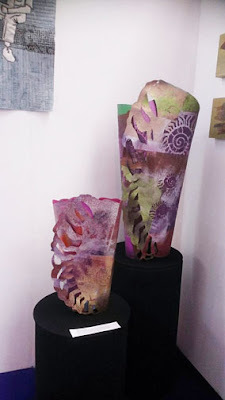 My good friend Wendy Dolan had a stand opposite our gallery, not only was it great to have a chance to catch up with her, but she also leant me her trainers to help my 'wraps' stay upright. I haven't quite mastered that yet!!! 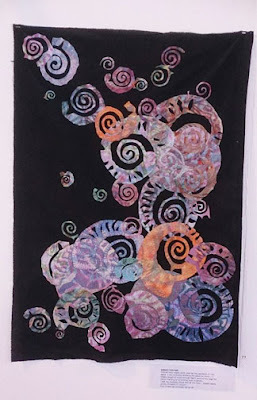 I have been playing with a new fusible web that can be painted and printed on as it doesn't have a backing paper. Great for overlaying. These four canvases are as far as I got. 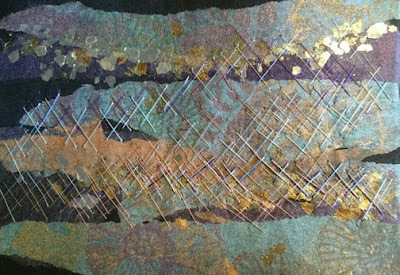 Layers of printed and painted fusible web decorated with gilding flake, mica flakes and hand stitch. 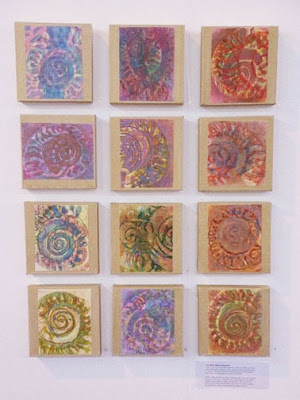 Mounted onto canvases. Those of you who have been following my exploits during and since my trip to New Zealand in January, will be aware of my love of baby wipes!!! I use them to clean my printing blocks. I was so pleased with the baby wipes I ended up printing and re printing on them and totally forgot about my 'proper' printing. One of the baby wipes mid stitch. I chose 12 baby wipes to stitch into . . 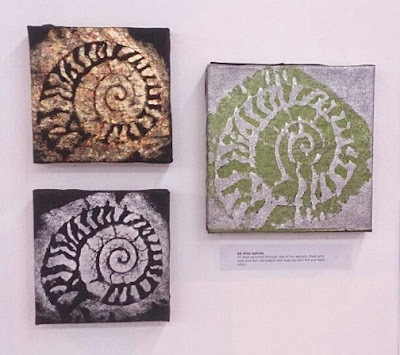 The baby wipes mounted on canvases. The baby wipes that weren't exciting enough to be interesting by them selves were made into an applique piece. This piece is called Lesson Learned!!!! 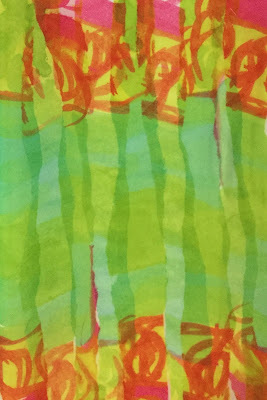 I am forever reminding my students to leave enough space around the edge of their work to mount or wrap the edges around a canvas. And what did I do???? Work right up to the edge. I was enjoying having time to stitch in the sun in New Zealand and totally forgot about leaving space. aaRRGHHHH!! A detail of the applique. 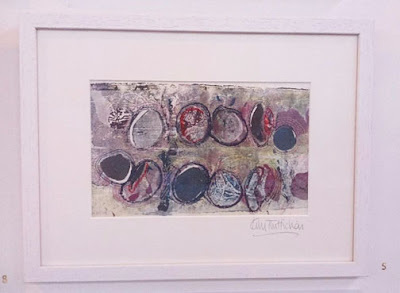 I hung the piece unframed and the edges unturned as a lesson to everyone who had a look at the show. It caused a few laughs. 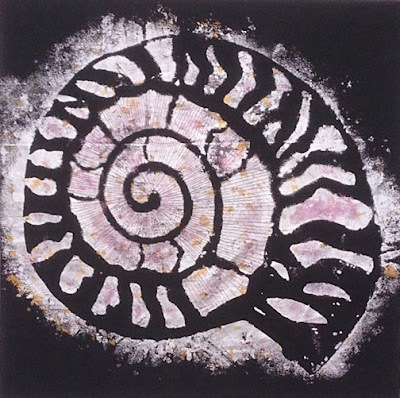 My spiral stencils have been very popular and it was good to have a chance to show what I had done with my KK Glue and the stencils. This was made with my large stencil, it is 24" x 24". KK Glue, silver and pink foil and pink hand stitch. These are smaller versions of the image above. The top left is gilding flake then gold foil on the KK Glue. 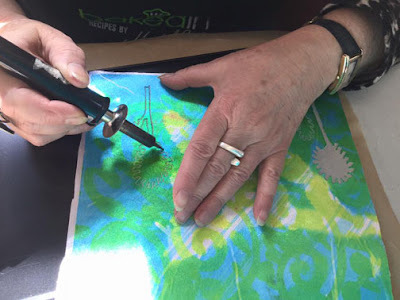 Gwen is a fabulous tutor, allowing you personal development within the workshop. She is both an inspiration and great fun!! Being 'just' samples, again I hadn't worried about leaving enough space around the edge of the prints for framing . . . 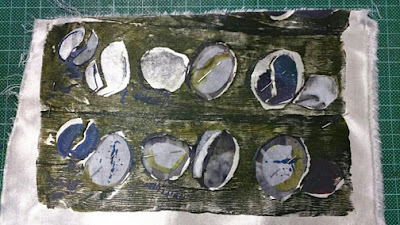 The prints started with a line of stones . . . Which were drawn and roughly painted . . . 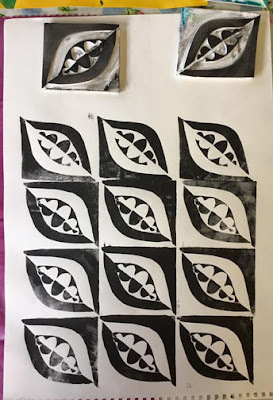 I then made printing blocks from the drawing . . . The bottom block is made with string and double sided tape. 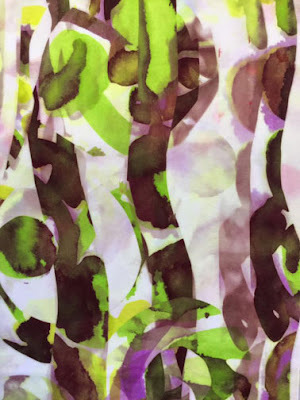 One of the first prints on viscose satin. I love the matt surface of the acrylic paint against the shine of the satin. Starting to cut back and rearranging the cut outs. Note how tight the print is to the edge of the fabric - Doh!! 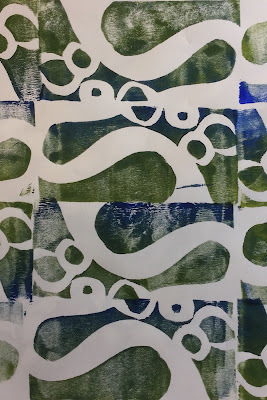 Layering a print on cotton organdie with a print on viscose satin. The finished print, stitched and framed. It's amazing how 'just' a sample can become something special when it is stitched and framed. 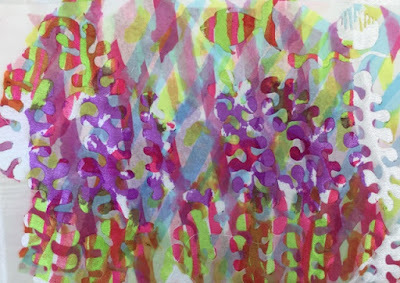 This print is Anne Kelly's new book Textiles Nature. So - my Places in the gallery turned out to be things that I had picked up in Places that I had visited, no one seemed to notice . . . 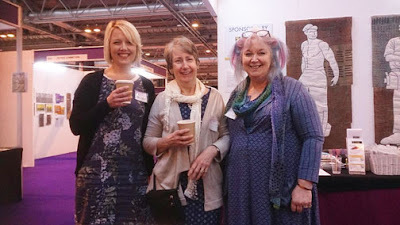 It was wonderful to have work to talk about to visitors and friends at the show. I am going to do more . . . and more . . and . . .
One of the very good things of doing shows, is the opportunity to catch up with friends from all over the country. Claire Muir (Nutt), Wendy Dolan and Susan Chapman. I shall be with Wendy and her lovely man rob at Excel next week. Our stands are next door to each other. Sorry this has been a long one - I was obviously in the mood. Hope you found it interesting. I am teaching all weekend and will post about it next week. I will pop some pics on Facebook as we work. Hello Diana - 3 weeks to go ish!! Poor Les . . .
Hello The Divine One from Manchester with the exciting news. Hello Tod - was talking about you today, will hopefully SPEAK to you very soon, love you baby.